Your bedroom is a much more important space in your home than you may realize. In order to get maximum benefits from this space it should be a calm and soothing retreat for you to retire to at the end of each day. 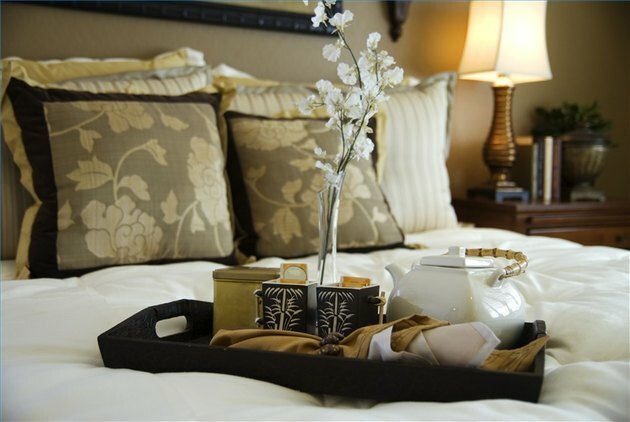 Your bedroom should recharge your mind and body and be conducive to a great night's sleep. Many of us skimp on our bedrooms and rob ourselves of the comfort and luxury we deserve. Giving your bedroom a five star hotel makeover can be much more affordable than you might think. If you're ready to have the bedroom of your dreams you've come to the right place. Wall color is the first area to focus on. No matter how wild your style is you should save the bold and outrageous colors for other rooms in your home. Choose muted calm colors for your bedroom such as light blues, sage greens and neutral linen shades. Giving your room a fresh coat of paint in a soothing color is one of the most affordable things you can do to make a huge difference in your room's over all feel. Make you bed fit for royalty. Never skimp when it comes to your bed. Pick a mattress that you find irresistibly comfortable. If you don't have the funds for a new mattress set, there are things you can do to breathe new life into the one you already own. Consider buying a memory foam or down filled mattress topper. In order to get the most for your dollar don't buy a mattress pad from a department store. You can find high quality pads at closeout stores such as Big Lots or TJ Maxx. The same goes for sheets and bedding. Aim for high quality sheets with a thread count above 350. Luxury linens don't have to cost you an arm and a leg. I just recently bought a set of 600 thread count 100% Egyptian cotton queen sheets from Ross for $35. You just have to shop smart! Get rid of the clutter! Keeping junk in your bedroom degrades the overall style of the space and can actually interfere with your ability to relax in the room. Store junk in decorative baskets and bins to keep it out of sight. You can also use under the bed boxes to keep clutter under control. Add aromatherapy to your bedroom to create an ultra relaxing ambiance. Place reed diffusers around your room on your nightstand or dresser. Choose scents that are calming such as lavender, vanilla or chamomile. Save money by purchasing your diffusers at bargain stores like Wal-Mart. It isn't necessary to buy high end scents at home interior shops or department stores. Most bargain store home fragrances smell just as lovely as their pricier counterparts. What Is the Cost of Upgrading to a King-Size Bed?